Jardines del Rey (King's Gardens) is the name of an chain of islands located off the northern coast of Cuba. This achipelago is itself part of a larger one called Sabana-Camaguey with over 2,500 small islands stretching for about 450 km (280 mi) along the Atlantic coast of Cuba’s main island, from Punta Maternillos in the province of Camaguey (near Playa Santa Lucia) up to Punta Hicacos (the tip of Varadero's Peninsula) in the province of Matanzas. The Jardines del Rey extend for 200 km (124 mi) on the south-eastern part of the Sabana-Camaguey archipelago and include, among others, the following keys (from west to east): Cayo Las Brujas, Cayo Frances, Cayo Ensenachos, Cayo Santa Maria, Cayo Guillermo, Cayo Coco, Cayo Romano, Cayo Paredon Grande, Cayo Anton Chico, Cayo Megano Grande, Cayo Cruz, Cayo Guajaba, Cayo Sabinal. 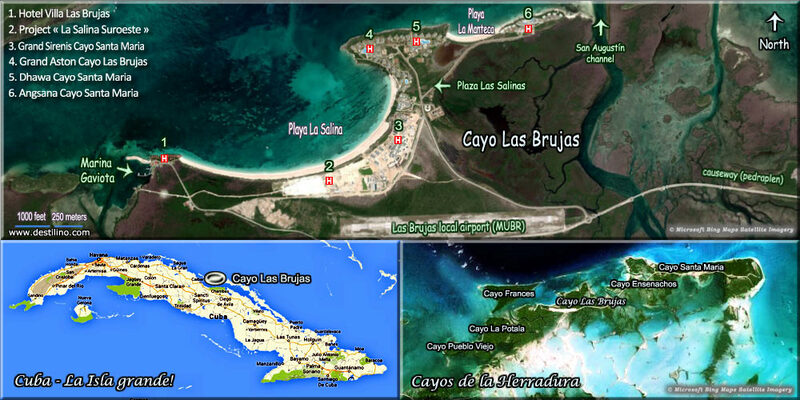 Note that Cayo Coco, Cayo Guillermo, Cayo Santa Maria, Cayo Ensenachos and Cayo Las Brujas, are currently the main tourist destinations of the King's Gardens. But "touristically" speaking, Cayo Coco and Guillermo are known as the “Jardines del Rey” resort, whereas Cayo Santa Maria, Cayo Ensenachos and Cayo Las Brujas are known as the “Cayos de Villa Clara” resort. Other cayos are currently under development. The archipelago is connected with the main island of Cuba via three causeways (locally called Pedraplen). 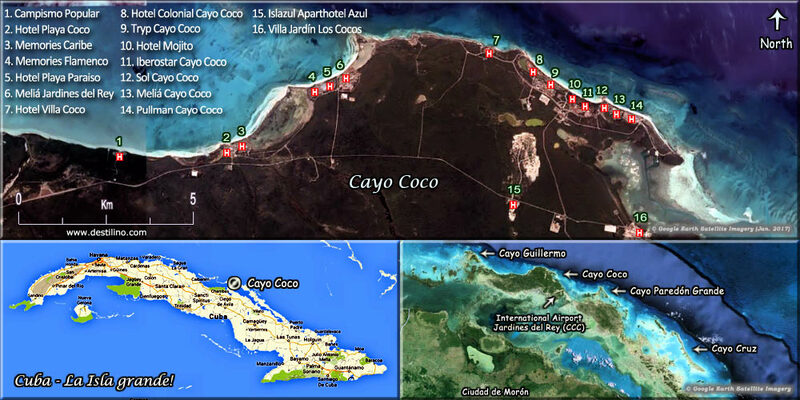 Cayo Coco to the main island in the province or Ciego de Avila (inaugurated on July 26th, 1988). Cayo Guillermo is connected to Cayo Coco via a short bridge. 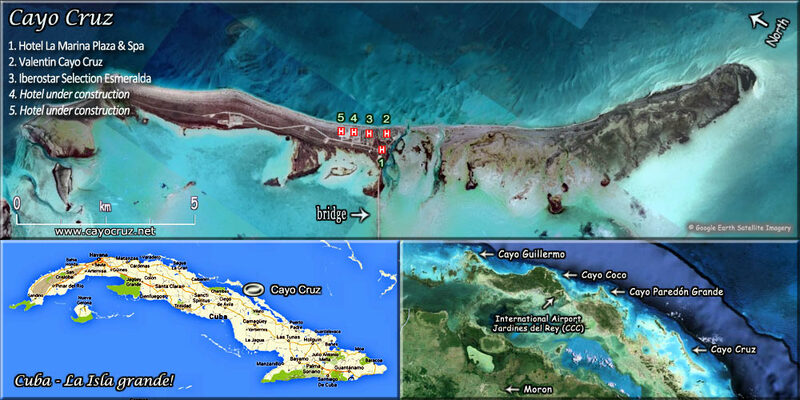 The "Cayos de Villa Clara" (Cayo Las Brujas, Cayo Ensenachos and Cayo Santa Maria) are connected to the mainland by a 48-km causeway (inaugurated in 1999). There's a third one in the Camaguey province connecting the main island with Cayo Romano and Cayo Cruz. Cayo Coco is a small island part of the "Jardines del Rey" (King's Gardens) archipelago located off the northern coast of Cuba (Atlantic side), in the province of Ciego de Avila. It’s a popular tourist destination known for its stunning beaches and coral reefs. Cayo Coco has a superficies of about 370 sq. km (143 sq. mi), making it the second largest in the Jardines del Rey after its neighbor Cayo Romano (465 sq. km). It’s named after the white ibis which is locally called coco bird. Cayo Cruz is a small island of the eastern part of the "Jardines del Rey" (King's Gardens) archipelago located off the northern coast of Cuba (Atlantic side), in the province of Camaguey. 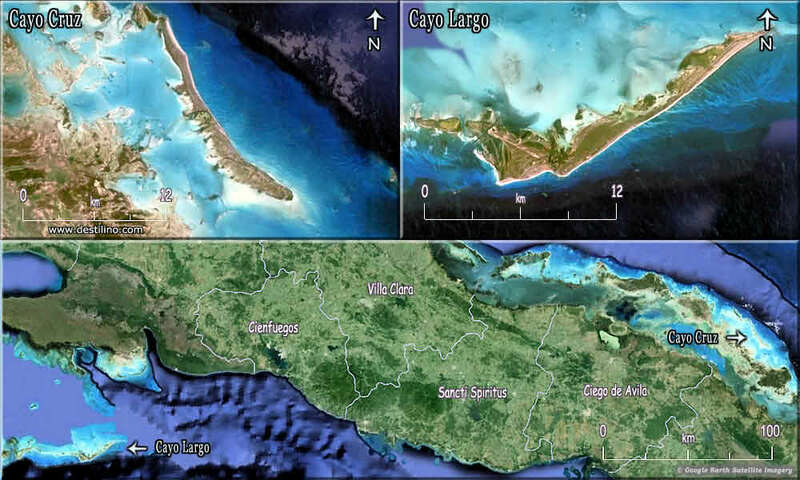 Cayo Cruz is about 32 sq.km (12.3 sq.mi), roughly the same size as Cayo Largo, (another popular resort island south of Cuba). Cayo Ensenachos is part the Cuban beach-resort called “Los Cayos de Villa Clara”, located off the northern coast of the province of Villa Clara, and that also include Cayo Santa Maria and Cayo Las Brujas. This small group of keys is part of a larger archipelago called “Jardines del Rey”. The "Cayos de Villa Clara" are connected to Caibarien (small fishing town on Cuba's main island) by a 48km-long causeway which runs across the Bahia Buenavista. 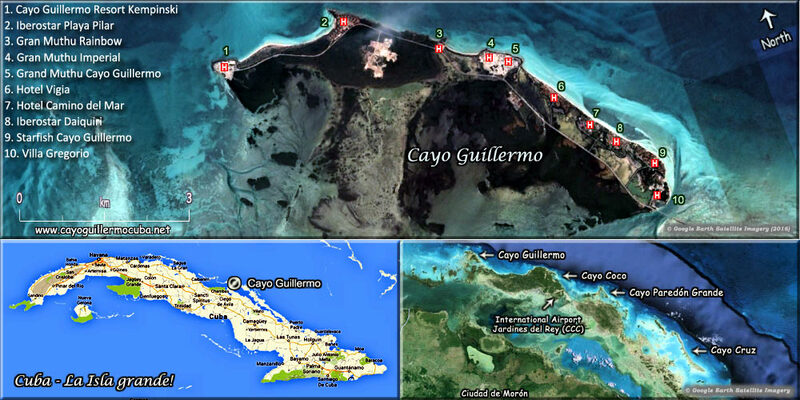 Cayo Guillermo is a tiny island of about 13 km2 (5 sq. mi). It’s part of an archipelago (and popular tourist destination) called "Jardines del Rey" (King's Gardens), located off the northern coast of Cuba. On its neighbor, Cayo Coco, you’ll find the Jardines del Rey International Airport (aka Cayo Coco Airport), inaugurated in December 2002. 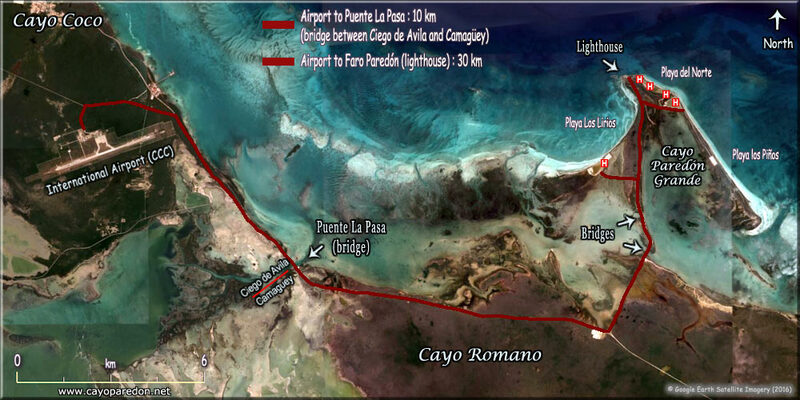 Hotels on Cayo Guillermo are about a 45 minutes' ride from this airport. A 300-meter-long bridge connects the two cayo. Cayo Las Brujas (Witches Island) is a islet of about 7 km2 (2.7 sq.mi) which is part of the "Cayos de Villa Clara" (aka Cayeria del Norte) located north of the Cuban province of Villa Clara. With its neighbors, Cayo Santa Maria and Cayo Ensenachos, Cayo Las Brujas is connected to the main island of Cuba by a 48-km causeway (locally called Pedraplen), from the coastal town of Caibarien. This resort-island is mainly served by the Santa Clara International Airport (Aeropuerto Abel SantaMaria). Cayo Paredón Grande (a.k.a. Cayo Paredon) is one of the next tourist destinations to be developed in the Cuban archipelago called Jardines del Rey (King’s Gardens) off the northern coast of Cuba, next to Cayo Romano which is the largest island of this archipelago, which also include the popular tourist destinations of Cayo Coco and Cayo Guillermo . 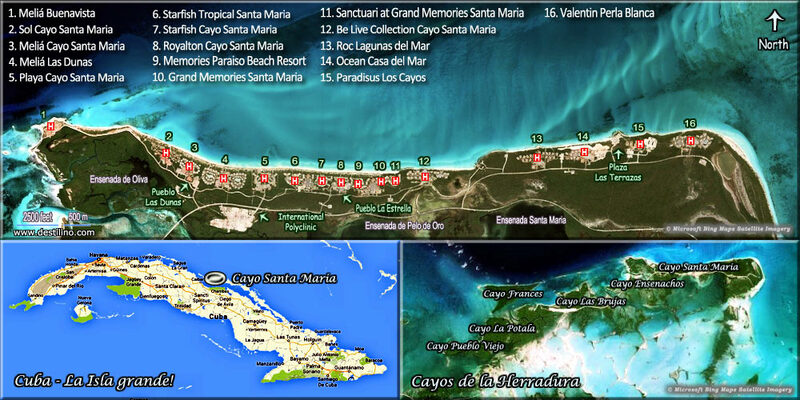 Cayo Santa Maria is a small island (about 16 km long by 2 km wide) with pristine beaches and luxury all-inclusive resorts. 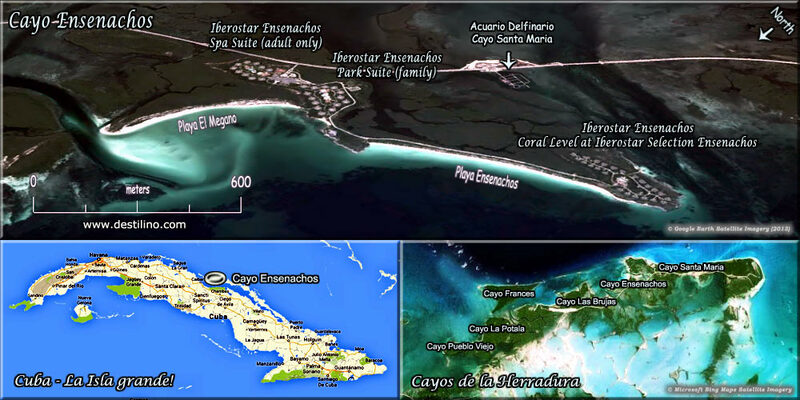 With its two neighbors, Cayo Las Brujas and Cayo Ensenachos. These islands are located off the northern coast of the Cuban province of Villa Clara, and they are part of a larger archipelago called "Jardines del Rey" (King's Gardens). The “Cayos de Villa Clara” are also part of the UNESCO-recognized Buenavista Biosphere Reserve.